A few Saturdays ago, the three of us headed to Dollywood to see it all decked out for Christmas. It was a sunny and warm (in the 60’s) and we live only about an hour or so away. 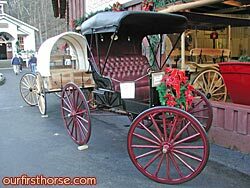 One of my favorite parts about Dollywood was a visit to the carriage maker. The park has real craftsmen on staff doing things (mostly) the old-fashioned way. It’s part theme park attraction and part craft preservation. I’ve never before seen someone build a carriage. What struck me the most is how reasonably priced the carriages were. You can get yourself a fancy brand new one or two-horse carriage, complete with hydraulic brake system for around $2,500. Now that’s a lot of money but you get a hand-built horse carriage made from high quality parts that can be used for pleasure riding, parades, weddings…whatever. If we find ourselves with $2,500 too much one year, I’d love to buy one of these. I can’t even imagine one of our spirited horses pulling a carriage but I’m sure they’d be fine with training. Of course, Moonshine and Valentine probably couldn’t be paired due to their size differences so I guess we’d need a one-horse carriage. Mikki wants a doctor’s carriage like the one in the picture above. I think it would be fun to have a wagon that seats four. And I could probably justify spending that much money by saying we’d use it to make money giving rides at parades, fairs and other events. It would be an investment! Riiiiight. Do any of you have a carriage for your horse(s)? I’m looking for a horse drawn hearse to provide for funerals in my area. Do you have or know of someone who would have new or used black hearse? Edwin, where do you live? Your area code seems to indicate Alabama. I don’t know of any but perhaps someone else reading this post might.